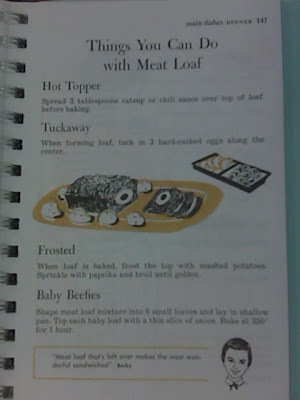 A couple of years ago Kate sent in a story about Frosted Meatloaf and how she learned about it through the Betty Crocker Cookbook for Boys & Girls and wished her mother would make it for her birthday. Yesterday, by some random chance, I stumbled upon a facsimile edition of the 1957 issue of this cookbook and managed to snap a photo of the meatloaf tips page. Spread 3 tablespons of catsup or chili sauce over top of loaf before baking. When forming loaf, tuck in 3 hard-cooked eggs along the center. When loaf is baked, frost the top with mashed potatoes. Sprinkle with paprika and broil until golden. Shape meat loaf mixture into 8 small loaves and lay in shallow pan. Top each baby loaf with a thin slice of onion. Bake at 350 for 1 hour. This is such an awesome quote!